Even with a cursory look, these figures appear to be out-of-place in Chennai. The headgear, tunic, leggings and footwear, all indicate a nativity that is not from the southernmost states, where it was much more common for guards or soldiers to be bare torso-ed. More details about what these figures are guarding will come up in a future post, but for now, can you guess which part of Chennai these figures can be found in? This house and grounds have not changed since the time I first saw them as a school-kid, over 30 years ago. But in the 220 years or so since Dr. James Anderson built his house, the property has undergone several changes - and a lot of shrinkage. Dr. Anderson landed up in Madras in 1761, having completed his MD from Edinburgh, looking for a fortune in the territory of Fort St George. It took him a few years to be appointed as the Company's Assistant Surgeon at the Fort; that was in 1765 and over the next couple of decades, he rose to become the Physician General at Fort St George. Dr. Anderson was keenly interested in botany. He set up the first botanical gardens in India, a 2-acre plot in Saidapet. That was not merely a hobby; the garden, more specifically called a nopalry, was intended to rear cochineal insects, whose secretions of carminic acid were the basic ingredient for carmine dye (used today in lipsticks and food colouring). These insects are native to South America, which meant that Spain controlled much of the carmine market; a situation unacceptable to the East India Company, which is why Dr. Anderson's nopalry was funded by them. The nopal cacti (g. Opuntia) are the cochineals' preferred hosts and with the nopalry, the East India Company was (probably) able to break the Spanish monopoly. With that, Dr. Anderson was as close to royalty within the East India Company. It was therefore no surprise that he was given a 110-acre grant of land in Nungambakkam. That grant covered the land between the Nungambakkam edge of the long tank - what today is Pycroft's Gardens - and extended all the way to the banks of the Cooum. (I am being a bit fanciful here, as I haven't really looked at any map from those years!). It was in these gardens, that Dr. Anderson built his second botanical garden - this time to grow mulberry bushes and silkworms. This was not as successful as the nopalry had been. Very early in the 19th century, Edward Clive (the 2nd Baron Clive) then Governor of Madras, had all the mulberry and silkworms packed off to Mysore - a move that over time led to Mysore being the home of sericulture research in India. After Dr. Anderson's death in 1809, Anderson's Gardens was fragmented and acquired by various Company notables. This house, named after the man, on the road named after him, became part of the estates of the State Bank of India. Today, it lies in poor condition, used as dumping ground for the bank's furniture. A sad state of affairs for this house - to be overrun by worms and insects other than the ones its original owner grew! For other school-kids who passed that way with me: No. Cochineal insects had nothing to with Cochin House being just a couple of hundred metres away. The name on this building belongs to the second generation of a family that has been in the plantain business for so long - over a century - that the third generation of the family, which runs the business today, is proud of being known as "Vazhaipazhakkarargal" - the banana people. The first generation was the patriarch who started it all. That was Ragavalu Naidu, who began as a gumastha to a Somu Naicker, who was in the plantain trade in George Town in the mid-nineteenth century. Ragavalu Naidu's sons, Govindaswamy Naidu and Kanniah Naidu followed him into the trade. The latter was born in 1895, married, had children and then lost his first wife in 1918, and then his second wife in 1926. He married again and his third wife was luckier, living with him well into a ripe old age. However, the business wasn't so lucky. Debts mounted and the firm of Ragavalu Naidu and Sons had to sell their properties and finally the business itself. The elder brother's sons appear to have had no interest in reviving their plantain trade, but Kanniah Naidu was keen to re-start and seems to have done so with his sons. Walking down Bunder Street these days, one does not usually have luxury of gazing up and around. But the stalks of the banana flanking the firm's name caught the eyes. The story of the business came from a very quick (and cursory) search on the Internet. I might be wrong, for the search results talk about M.R.Kanniah; but we shouldn't let the facts come in the way of a good story, right?! That is what it seems to be; this road sign on Radhakrishnan Salai has been given a coat of paint that dulls, but does not entirely hide, the words underneath. No idea why it should be this way. Do you have any guesses? The eastern coastline of India is called the Coromandel Coast, which is the anglicized version of "Chozhamandalam" - the domain of the Chozhas. From their capital at Thanjavur, the Chozha emperors ruled over a territory that at its peak covered all of south India, and most of the east coast up to Bengal. Rajendra Chozhan extended the influence of the Chozhas across the seas, taking over parts of today's Thailand, Cambodia, Lagos, Vietnam, Malaysia and Indonesia. Rajendra's reign extended so far to the north that he was also titled 'Gangaikonda Chozhan', the one who acquired Ganga. It is by that title that he is referred to in this hall - Sree Gangaikondan Mandapam - in Triplicane. The hall is used for recitals, discourses and similar events, mainly associated with the temples in the vicinity. But I am a bit confused. The hall seems to be associated strongly with symbols of Vaishnavism, including the images of Garuda at the corners of the roof. Rajendra was the successor of Raja Raja Chozhan, who had had the Brihadeeswarar Temple at Thanjavur, where Shiva is the main deity, built. That temple was the inspiration for his son to build a similar one at Gangaikonda Chozhapuram, which was also dedicated to Shiva. So, does this mandapam really go back to the Chozha times? Or is there some other Gangaikondan being referred to here? This address, on 89, Radhakrishnan Salai, was once the residence of a judge of the Madras High Court. PN Ramaswami Iyer and his wife Rajam lived here. The house they owned here was named "Vinnagar". Loosely translated, it means the "place in the skies". The building that has come up in its place reflects a lot of the clouds, but can it ever be the place in the skies? This may not look like much, but in a parched city, it is the best expression of social concern. Even after all the rain last night, there would be enough thirsty souls walking down the road where these taps are. Early morning, on Broadway, the newspaper bundles have arrived. The bundles need to be unpacked and re-packaged into smaller units for distribution locally. There were about 20 such individuals carrying out the task - that's quite a distribution challenge! Last week, after hearing about a slice of Burmese history in Madras - which I was completely unaware of until then - it was absolutely coincidental to come across this sign. There must be a few other Burmese outlets in Chennai, but I can't remember any of them off the top of my head! By rights, this building should have celebrated its centenary with great pomp and show five years ago. Its foundation stone was laid by the grandson of the lady whose name it bore; called the Victoria Memorial Hall, it took three years to build. Prince George (later King George V) laid the foundation stone on January 24, 1906 and it was open to public on March 23, 1909. Henry Irwin, the architect who is usually remembered in the context of Indo-Saracenic style, took inspiration from Mughal and Rajasthani designs for this building. The canopied turrets and the Jaipuri-Jaina windows got this building to stand apart from its neighbours. The first occupant of the building was the Victoria Technical Institute which had until then been functioning from the museum itself. The VTI operated from this building until 1951, when it was taken over by the government. It continued to be associated with arts and crafts, for it now housed the National Art Gallery. There was quite a lot of art there, with paintings from the Mughal period, rock art, traditional Indian paintings and quite a few paintings from the British era. Most of those works were moved to the new art gallery building right next to this, sometime in 2003; for by then, the Victoria Memorial Hall had been deemed unsafe for use. Last year, a renovation project was announced with much fanfare. Apart from putting up a metal screen/barricade around the front of this building, not much more was done on the renovation front. In some ways, this is quintessential Chennai: grand ideas and beautiful structures. But somehow, they stay hidden, not thrusting out in-your-face, but knowing that there is beauty here, even if you have to come over all the way to this corner of the museum and have the patience to look beyond the barricades! Despite being one of the most historic buildings in the city, Doveton House is not easily accessible to the public, being situated inside the Women's Christian College in Nungambakkam. Maybe it is just as well, for the college has been able to maintain the building in possibly the same shape it was constructed, well renovated and with few, if any, modifications. Coming in from the main gate of the college, we get to see this magnificent building, constructed in 1798 from the designs of Benjamin Roebuck, an architect in the service of the East India Company. The purpose for which it was built is not very clear, but in the early 19th century, it appears to have passed into 'native' hands. It is said that Lieutenant General John Doveton, in whose name it continues to be known today, acquired it from a Linghi Chetty in 1837. As to whether that was the same Linghi Chetty who has a road named after him in George Town, your guess is as good as mine. It is said that when Lt. Gen Doveton died in 1847, he bequeathed the property to a "brahmin family". Little is known of that bequest, but within a few years, Doveton House had become Company property, with the East India Company using it as accommodation for its troops and officers. In 1875, it was used for a different purpose: as the venue for the house arrest of Malharrao Gaekwad of Baroda, for his role in the attempted poisoning of Col. Sir Robert Phayre, the British Resident of Baroda. Much later, in 1914, it was the venue of the 29th session of the Indian National Congress, which was historic if only for Lord Pentland, the Governor of Madras, dropping in on the proceedings. In 1916, Doveton House and other buildings in the 11 acres of its gardens were bought by the Women's Christian College. A description by Dr. Eleanor McDougall, the first principal of the college, describes it as having "stabling for twenty horses, a band stand...the tallest porch in Madras". The purchase was funded by by a gift of $25,000 from the Laura Spelman Rockefeller Legacy. John D. Rockefeller's munificence continued in the form of further funding for building a chapel and a science block. The college continued to grow over the years, but Doveton House has remained its nucleus, housing the Principal's office on its ground floor. As I said earlier, the building remains true to its original construction, but try as I did, I could not make out where the "...little tower", as Dr. McDougall wrote, "for monkeys to live in..." could have been! How long does it take to write a book? Quite a while, apparently. It has taken a lot of travelling, a lot of cloak-and-dagger meetings, and a whole lot of surreptitious telephone notes and sketches for Samanth Subramanian to get his second book out on to the shelves. The first was four years ago, and the years between, on the evidence of the first few pages of his new book, have been spent well. This Divided Island does not have a political agenda. It is very easy for the Lankan civil war to grab any discussion about it and drag it to an abusive free-for-all. The first evidence of that was in 1985, when some of my college-mates went on a signature campaign against the government of Sri Lanka, and the years since have hardened stances. I am looking forward to reading this book. I thought I would be able to finish a substantial part of it before its Chennai launch ten days ago, but it is not a light read. There will be no chest thumping, guts-and-glory story. The stories will be of ordinary Sri Lankans, voiceless people who were the worst affected in the 3-decade long war. The war ended in 2009. These stories will live on for ever! In the background, the Pallavaram hills look on; they have seen several days in their time, and this is no different from the many they have seen. They must be very old hills, for they have been worn down to almost sea level. This is also the area where traces of a palaeolithic settlement have been found. The slowness is seen in the parking lot of the Chennai airport in the foreground. Usually a mess of vehicles trying to go every which way, the lot seems quite sleepy - but this was last week, before the long weekend, when almost everyone had probably got to where they wanted to go! Auctions in Chennai bring to mind only one name: Murray. That name was borne by a gentleman who, in January 1915, was appointed as a judge of the Madras High Court. Three other names he had, for he was fully Sir Victor Murray Coutts-Trotter; and it took him another nine years to become the Chief Justice of the Madras High Court. During his tenure as the Chief Justice, he learnt that the firm Dowden & Co., auctioneers, was shutting down and moving back to England. The courts needed an auction house and Sir Victor looked around for one. He finally sounded out S. Vedantam, who was working with Dowden & Co., about the need to set up one. Vedantam took the justice's approval to name the firm after him. And so was born, in 1927, the firm Murray & Company. Whether the Hon'ble Justice had any stake in it is unclear, but very soon, Murray & Co., was appointed as the Receivers for the Madras Presidency. With business growing, operating out of a small office on Thambu Chetty Street, near the Court, was not good enough. A branch was opened on Mount Road, within the grounds of Kushaldas Estate. That branch, was in these premises, tucked in behind the LIC building. A year ago, the building was deemed unsafe for occupation and that, probably more than anything else, forced the firm to move away to Mylapore. Over the 87 years of its existence, Murray & Co. has handled several auctions, both public and private. They have sold a hospital, a king's residence, army surpluses... pretty much everything that is fit to be sold. Given a few months, they would probably have been able to find a buyer for it themselves! The ninth avataram of Vishnu was the one who knew of his Godliness right from his birth, unlike the earlier avatarams who were completely ignorant of their divine spark. Krishna knew that he was a God and was not exactly shy of showing off. Stories about his childhood are legion and these stories are recalled today, as much of the country celebrates his birth with much festivity today. Most of the celebrations in Chennai are of the "at home" variety. The common theme is the outline of the boy Krishna's footsteps as he trails them after knocking down the pots of butter - and then there are all the eats to be had, the music to be listened to, all of which celebrate Krishna's carefree boyhood rather than his life as an adult. For this day, here is a painting of Krishna with Yashoda, his foster-mother. There are several representations of this duo, but this is not one of the more common ones. But it is by Raja Ravi Varma, the man who single-handedly gave a face and form to most Gods and Goddesses of the Hindu pantheon. This oil-on-canvas can be found in the Chennai museum, along with a few others of Ravi Varma's canvases. Go on, enjoy the day! Like the Buddhist temple of a few weeks ago, I had assumed that there was only one Sikh gurdwara in Chennai. Maybe that is still true, but just as with the Buddhist temple, there is a second gurdwara in the city, hidden inside the Huddleston Gardens of the Theosophical Society in Adyar. It doesn't seem to have been used often. But it is there and it did not look like anyone is going to challenge you if you choose to use this as a house of prayer. The Theosophical Society has such buildings around, representing the larger religions that the Society tries to replace, or at least subsume into itself. However, I sense a problem. A gurdwara is just about any place where the Guru Granth Sahib has been installed and is taken care of very reverentially. Forget the latter, I don't even think the former has happened in this building! At the north-eastern end of Napier Bridge is this obelisk, which, until a few days ago, was a mystery to me. It has a masonry base - and the entire structure is brick and mortar itself. The base has no indication of what it is for; as if to tease the curious passerby, there is a rectangular indentation in the base which makes it appear as if there was an intent to have a plaque there, but that the idea has been dropped and no one has bothered to fill up the space, or to finish up the rest of the column itself. The structure seems to date back a long way. An early picture of the bridge, said to have been taken in the 1890s, shows the obelisk at its end. When I posted a picture of it a few years ago, I had tried to get the column in its entirety. It was only a few days ago that I realised I had missed the most important aspect of this structure. The thin metal rod topping the masonry. 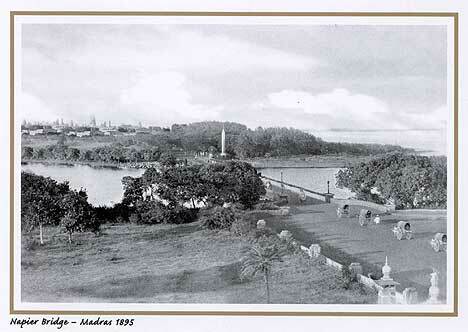 The Napier Bridge - named for Francis Napier, the 10th Lord Napier, who was Governor of Madras between 1866 and 1872. It was during his tenure that this bridge, to connect Fort St George with the sandy strip of beach to its south, was built. At that time, there was no concrete to build a bridge with; the strongest material for such purposes was iron, and that was what was used to make a sturdy bridge. Although its concrete replacement came over 70 years ago, the Napier Bridge is still referred to as Iron Bridge. In the days when the bridge lived up to its name, the biggest threat it faced was from lightning strikes during the monsoons. That could only be removed by having a much taller attractor of electric current - and hey, presto, the mystery of the obelisk has been solved! In the airport, they are getting ready to launch a boat! The statutes at Peoples' Park were all originally white - or colourless, with their white paint having faded over many years. Around 2008, when the Corporation got around to re-painting them, they decided to go vivid colour. Maybe it was a good decision. The colours don't appear to have faded much over the past six years. The lady's saree looks as bright as it was when she first wore it! The Government Museum in Chennai has a very eclectic collection of artefacts. From the crocodile that was found in the Cooum to a schoolboy's toy bus claiming to be a model of the MTC buses, the collection has something in it for everyone. The pride of the museum, however, has to be its bronze gallery. Even if it is only they who say it, no one would dare to counter their claim that the museum has the largest collection of such antique metal under one roof. The gallery is home to over 1,500 pieces, the huge majority of them representing Hindu Gods and Goddesses. Roughly a hundred of the pieces are Jain and Buddhist; the remainder are a bewildering mix of periods, schools and sources. Having been the Presidency Museum, it was the place where any kind of uncommon object was sent out to from anywhere in the Presidency. The pièce de résistance of the bronze gallery is this figure of Siva performing his cosmic dance. All the other pieces in the gallery are enclosed in glass cases. The beautiful Ardhanarisvara image, set on a revolving base, grabs your attention as soon as you enter. There are several others that hold you spellbound. But taking a picture is a challenge, thanks to be intervening layers of glass and the reflections therefrom. The idol of Siva, set on a raised stage at the far end of the gallery, has its special background. With no glass covering it, visitors can marvel at this wonderful figure from the 12th century CE; and no, it is not called the Nataraja, or "King of the Dance". Given the intense feelings it brings out in anyone who passes by, it seems more meaningful to call him what is a greater title - Natesha, the "God of the Dance"! Pradeep Chakravarthy is a management consultant. But he is more than that, as well. He is deeply interested in the history and heritage - of this part of the world, specifically. He has written "Thanjavur: A Cultural History" and has also been the editor of a collection of writings on Kodaikanal. So, when he announces that he is going to lead a session to explain the basic differences between the Pallava, Chola and Vijayanagara styles, there is a rush to be part of that session. We were lucky to get in, and there we were at the Museum on Sunday morning. Basically: the Pallavas were the earliest of the three - their sculptures of Gods, or humans, were natural, showing them in relaxed postures, low on detailing, oval faces, cylindrical headgear. Through the Chola period, the figures became more stylized, the headgear conical, faces rounder and the body began to take postures that would have been difficult to sustain in real life. The volume of sculptures grew through the Chola and the Vijayanagara dynasties, and they became more 'industrialized'; templated designs and details, churned out by moderately skilled craftsmen, sacrificing originality and natural representation for the ease of mass production. There were more details, and Pradeep weaved them into a tapestry of how life must have been in those days of yore; it was a compelling performance. The importance of noticing details, which is what helps you become a more-than-an-open-mouthed-gaper, was especially brought out right at the start. What most people would consider to be run of the mill stone columns near the statue of the Buddha are actually columns from the Pallava era, with inscriptions revealing what the king Mahendravarman considered himself to be. For more on that, over to Pradeep himself! In the earliest days of the city of Madras - essentially the Fort St George - the main exit from the city would probably have been through the Walajah gate, heading out west to the seat of the Nayaks at Poonamallee. There would have been less reason to go south; the twin rivers in that direction would have made it even less attractive. But by the early 18th century, the journey to the Mount was a reason for the residents of the Fort to cross two rivers. Bridges were required. The Elambore River was probably the easier to ford; there is a record from 1714 about a "Water-Gate Bridge" between the Fort and the Island. The second bridge, over the Cooum took another two years to be built. Called the Triplicane Bridge, it appears to have been a rather ill-fated bridge. In 1721, it was damaged by floods. Though it was repaired, repeated floods brought it down. As if nature wasn't enough, la Bourdonnais also brought it down. Between man and nature, the bridge kept falling down and rising up, until the new century came up. In 1805, a new bridge was built. The earlier one(s) never had any formal name(s) - Triplicane Bridge and Island Bridge were variously used, with startling originality. The same originality continued into the new century, with the new bridge. Or maybe it was just superstition or sentimentality, for the bridge was named after the patron saint of England. Not just that. It was called the New St George's Bridge, for, in the intervening period, the Water-Gate Bridge had been replaced by St George's Bridge about fifty years earlier. That name continued to be in use for well over a hundred and fifty years. It was only in the late 70s that it was renamed after EVK Ramasamy Naicker, and it is by his name that it continues to be known today - Periyar Bridge! A little behind the Music Academy, on TTK Road, this eatery has been a haunt for the displaced Malayalee ever since it opened about 30 years ago. I think it is a slight exaggeration to call it a restaurant, for it is a very basic operation. Tables, chairs, steel plates - maybe a few plain china plates as well - the waiters dressed as they please, no uniforms here, it gets to be about as authentic a Kerala experience as possible. There are some outfits that try to keep up with their early clientele, growing old - 'evolving', if you will - with them. And then there are others that try to stay young, staying with their original reputation, forever attracting a new generation of patrons. That approach runs the risk of being branded 'downmarket', especially if the new generation considers their offerings too old-fashioned. Kalpaka has probably got its act down well; their menu is just the standard, solid, regular fare, things that the Malayalee has been used to for maybe a couple of centuries. Aapam, the Kerala porotta, and the Kerala Syrian Beef Fry. These are comfort foods for the non-resident Keralite and there is still a regular inflow of them into the city, keeping Kalpaka in business - and true to its coconut oil roots! That's the only way to describe this creature depicted on the roof of a temple by the Cooum. For all its incongruity, it looks humanoid enough to scare away some intruders! The II Draft of the Master Plan for Chennai envisioned cycle rickshaws as a viable mode of para-transit, shuttling between residential areas and the collection points for the larger modes of transport. But that plan seems to be a fairly long way from being put into action. The cycle rickshaws seem to be where they were many years ago; not a single new rickshaw seems to have hit the streets. But they haven't gone away entirely, either. In some parts of the city - near the Central Station, around the streets of George Town, and towards the end of Mount Road, near Chintadripet - they are still quite common modes of transport. This one, however, does not seem to be in a hurry to go anywhere. Its owner/driver was sitting nearby, not a care in the world. The rickshaw doesn't seem to be damaged or having been hauled in for maintenance. Maybe it is just taking a break! This was raised in 2012 to commemorate the 60th anniversary of the Tamil Nadu legislature. It was earlier the Madras state and somehow it was felt necessary to mark the transition of the name of the state with this structure. It is called an arch, but its outline defies the definition. For better or worse, it is going to remain on the Kamaraj Salai for a while, so let us enjoy it while it is around! It has been a hundred years since the Great War began. Being a part of the British Empire at the time, India was drawn into the war, without too much of a say in the matter. Notionally a volunteer force, the Indian Army was pitched into several battles; with them were the armies of several princely states and European volunteers. The total number of troops from India was over a million. Almost four-fifths of them were sent to Middle East Asia, with the rest going to France and to Africa. Over 60,000 soldiers from India lost their lives in the Great War. The founding nucleus of the Indian Army, the Madras Regiment, had its fair share of causalities. The city decided to honour the fallen with a memorial at the south-west end of Fort St George. The space that was known as "Cupid's Bow" until then was cleared up and an open, circular stone pavilion was built. On the western side, the circle is marked with the years 1914 and 1918. This pillar, in the centre of the circle, was a later addition, after World War II. The years are repeated here. Around the circle, each section commemorates a battlefield where soldiers from Madras Presidency laid down their lives. Some of the names are no longer in common use: Mesopotamia, for example. Some others: well, they have become so enmeshed with fighting that one reads them with weariness - for example, Gaza. This memorial to the fallen soldiers of the Madras Presidency has been modified to reflect some of independent India's wars. Let us hope that there will not be reasons to keep updating this memorial! This building was one of the most visible faces of the Nilgiri's Dairy Farm - a business that was begun in 1905 when Muthuswamy Mudaliar, a dak runner, opened a shop at Charles Villa, Coonoor. Muthuswamy was probably servicing requests from the families up on the hills to bring up butter and similar products from the plains and he felt he could do better than to carry such stuff piecemeal. In 2006, after the business had completed a century, the PE firm Actis took a majority stake in Nilgiri's and franchised the brand. At that time, this store on Radhakrishnan Salai was the only one being run directly by the first family. Sometime last year, Prabhu Ramachandran, Muthuswamy's great-grandson took this property back from Actis, through the Blue Hills Group, an investment company with interests in diverse businesses. So now, the family of the founder do not have the rights to the Nilgiri's brand. The Blue Hills Group has bought, apart from this store, a few of the other stores as well. Having done so, they have brought a clutch of brands into their new chain. Many of them are new, and even seem to be homegrown in Chennai. But there is one large sign announcing this to be the "Waitrose London Supermarket" - though it seems quite different from that famous London supermarket! The road along the Cooum just after the Napier Bridge leads to the establishments of the Coast Guard, the Navy - the INS Adyar - and the CISF. Also along the road are residential quarters for officers of the Chennai Port. With so many government establishments along the way, signs and barriers - not to mention the odd security guard as well - make one nervous about pulling out a camera anywhere on that stretch. But the view from the end of the road gives you a fair approximation of what the Madras coast must have looked like in olden days. The sandy beach runs south for a fair distance. The buildings of the University of Madras, government offices along the coast, the TV tower and the multi-super-speciality hospital in the distance... that's quite an unusual view if you are not a resident of the naval quarters. The Cooum was still - as it is most of the time - and therefore looking deceptively calm. It was reflective of the lazy Sunday morning that it was! It is now over 5 years since the Madras Central Jail was demolished, making way for the new block of the Madras Medical College there. For the last few years of its existence, the Jail at Park Town had no inmates, all of them having been moved to the sprawling campus of the new, model prison complex at Puzhal. The earlier Central Jail in Chennai had about 11 acres of space; the suburban train track ran right next to it. The noise of traffic would not have been very far, either. The Puzhal complex is far bigger. For starters, it is not one prison, but three. The complex houses the Chennai Central Prisons I and II, each with a capacity of 1250 inmates. Then there is the Special Prison for Women, which can hold 500 women prisoners. All these are spread out over an area of 212 acres, almost in the middle of nowhere. At least, when the prison started functioning, there were not many other establishment on that stretch of the NH5, about 25km out of Chennai. Even now, there are not too many reasons to stop at Puzhal. The locality has a population of about 30,000, most of who seem to be living just across the highway from the prison gate. From the highway, the entrance looks quite neat, with arches above the gate not quite indicating what lies within. The prisoners here surely get a greater sense of loneliness than in the crowded Chennai facility earlier! That is the theme for the month, but what is a store if it is not to take things away from? This one in West Mambalam doesn't stop with the usual coconut biscuits, murukku and peanut candy, but lets you know that it offers food for thought as well. Though, with that spelling, one would be taking a big chance on what is going to be actually taken here! First of the month, it is the Theme Day again. Head over to the collection of theme day pictures from CDP bloggers around the world!